I'm sooooo bad for WIPs! 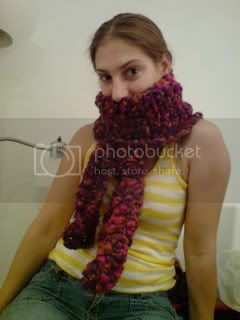 I just put the finishing touches on THREE scarves. All consist of plain ol' single crochet. I'll present them in reverse order of start-date (you'll see why!). I started this one only about 5 weeks ago and finished it two days ago. It's made from leftover felting-wool yarn from my BF's mom (she makes mittens and slippers with this stuff). Out of 5 colours, I have three colours left, but they are TEENY TINY little balls that I'll probably make flowers out of. 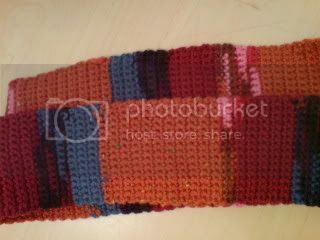 This scarflette was started in March and finished in May. All it needed was buttons, which were put on last night. 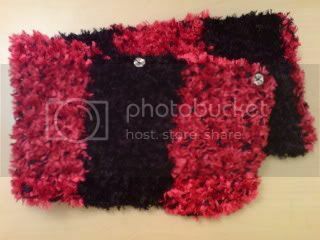 It's made from black acrylic yarn carrying black and pink polester eyelash. This is the LOOOOOONGEST WIP I've EVER had! 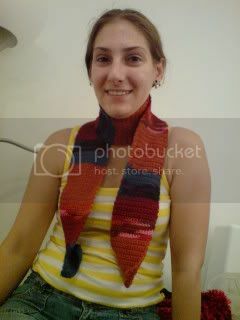 I started this scarf for my mother THREE YEARS AGO! I got sick of it because the tension has to be maintained PERFECTLY so that the nubbles are evenly spaced. I FINALLY finished it this evening. 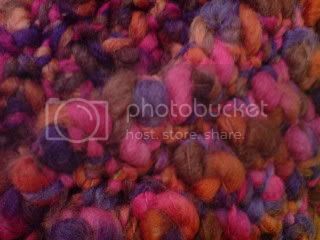 The yarn is even more gorgeous in person, made from a really soft and fluffy wool/mohair blend. 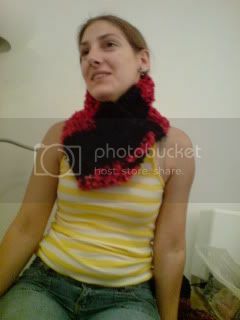 It took 4 balls, 2 each from different lots, which is why each half of the scarf is slightly different. 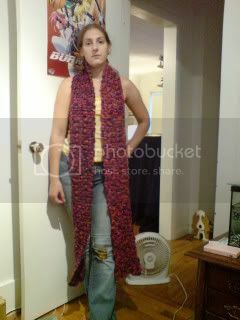 Finished length is about EIGHT FEET and Mumsie is shorter than I am. I almost want to make another nubbly one for me!